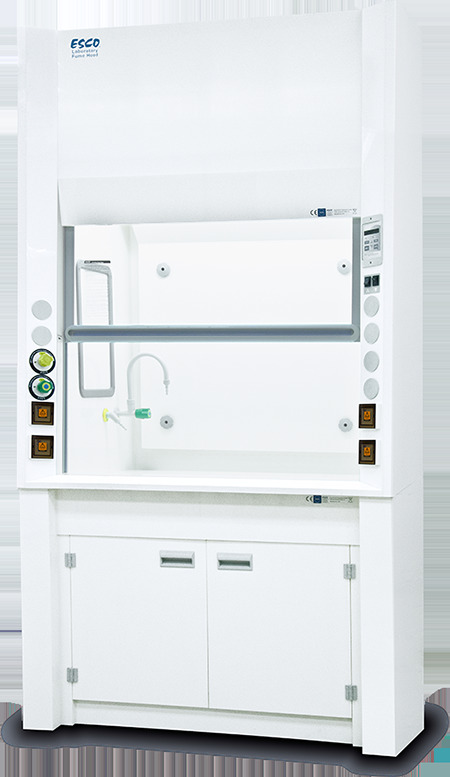 The Frontier PPH Fume Hood provides the highest level of protection and containment against highly corrosive chemicals. Its full polypropylene interior and exterior makes it metal-free, therefore suitable for sensitive work such as trace metal analysis. 2. Operates safely at 0.5m/s at 18" (457mm) or full open sash position constant volume concept eliminates the need forcomplex VAV systems. 3. Optional Sentinel XL Airflow Monitor accurately monitors face velocity and alarms when inflow decreases to unsafe levels. 4. The tapered PP exhaust collar reduces airflow turbulence, static pressure loss, noise level and increases face velocity uniformity. 5. Perforated Baffles: improve capture efficiency. 6. Air Foil: reduce turbulence and eliminate backflow. 8. Remote control water fixture and 1 gas fixture are factory installed and plumbed, Up to 4 services may be factory or field installed. 9. Perfect Pitch Profile™: 5° Angled Front, this gentle pitch of the hood profile enhances visibility and maximizes operator comfort. 10. Removable structure for easy access: baffles, panel on internal side wall and rear access panel. Sentinel XL airflow monitor (discussed above). Additional service fixtures and electrical outlets.